Significant facade work seems to be nearing completion on the Switch Building, located on the Lower East Side's Norfolk Street, which should probably just be renamed SoHo East by now. Designed by nArchitects to shake up a boring neighborhood that merely has a glass hotel tower and another made up of giant blue pixels, the building is being marketed by Prudential Douglas Elliman, but our search for listings/units sold info came up short. The official website even has a broken link back to the Elliman site, so no go there. I was wondering if there are any residents or businesses currently in the Lower East Side who may have information relating to exact spot where the abandoned tenement that was used as a set for the Academy Award winning 1969 classic, MIDNIGHT COWBOY, starring Dustin Hoffman and Jon Voight is located. I recently saw a documentary about the movie and I found out that the area they filmed in was a demolition site where a number of tenements were being razed at that time, which was 1968. I haven't been sucessful in finding out any information on where the building once stood, but did notice that the address was 64-66, and that's all. Also, there was a building across the street that read: CITY OF NEW YORK: BUREAU OF URBAN RENEWAL, PAY RENTS AT 376-8 GRAND ST. I'm kicking myself. I had the opportunity to buy in LES a few years ago when prices were low!!!! I cannot seem to find any information on the large empty lot on the North East corner of Delancey and Forsyth. Anyone know what's going on? Perfect for a boutique hotel, but probably more condos. Construction of the second phase of 50 Orchard Street, a handsome new construction development on the Lower East Side is expected to be completed this fall. The completed first phase consisted of 9 condominium apartments in an 8-story building. 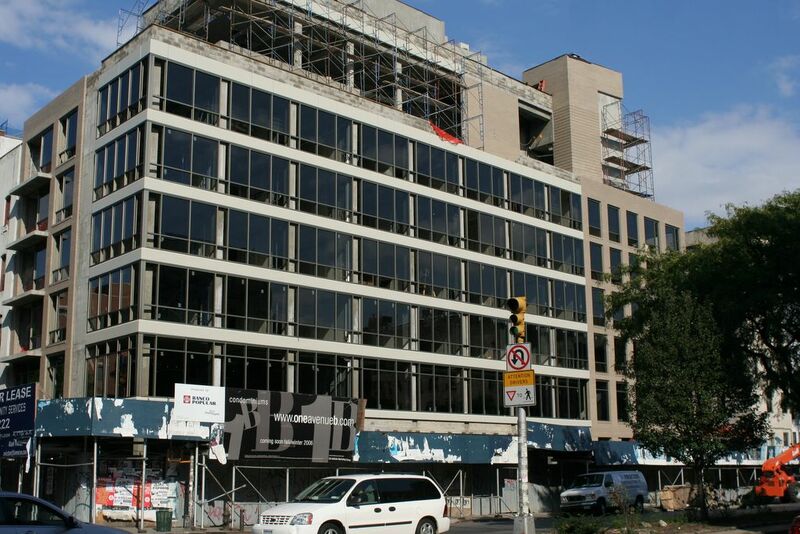 The second phase consists of a 10-story addition with two apartments per floor. condominium apartments. Michael Muroff is the architect and Voyager Management is the developer. The first phase has one- and two-bedroom units ranging in size from about 850 to 1,200 square feet. Some of its units are triplex apartments with double-height living rooms. The building's facade is varied in its fenestration pattern and section colors that range from light yellow to beige to pale gray green. The building is not far from Gus's Pickles and the attractive Liquor Bar further up the street and the Lower East Side Tenement Museum at 97 Orchard Street to the north and it is just to the north of the very attractive, red-brick PS 42 on Hester Street. Orchard Street is the center of the Lower East Side's "fashion" district, whose most famous store is S. Beckstein Fabrics, which is on Orchard Street north of Delancey Street. According to Larry Michaels of Prudential Douglas Elliman, the building has a roof deck, private keyed elevator access, storage bins, balconies, washers and dryers and Bosch appliances, slate floors in the bathrooms and a Seidle video intercom security system. Why don't they develop this godforsaken expanse of parking lots near the Williamsburg Bridge. Hard to believe this is Manhattan. While I'm having fun with live local, here's a shot of something I always thought deserved better treatment...the whole area around the entrance to the Manhattan Bridge deserves to be beautifully landscaped. The attractive columned structure at the entrance, if it were in Madrid or any other European city, would have flower beds, shrubbery, water shooting out, dramatic lighting, you name it. The area has several attractive buildings, and despite the confluence of traffic, could be made quite beautiful. This sucker promises to be one fugly mutha. 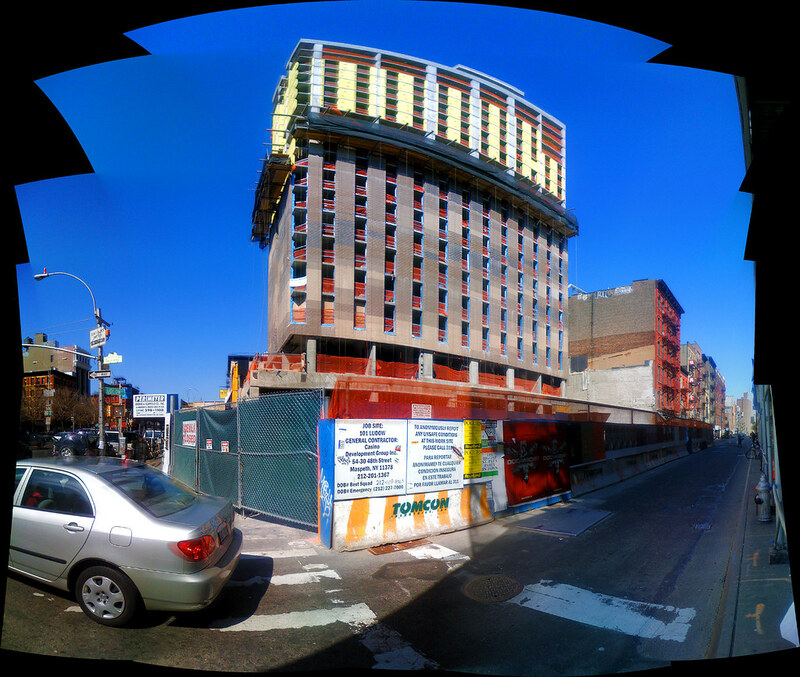 It's 101 Ludlow St. (at the NW corner with Delancey) and get this: it's going to be a dorm for the School of Visual Arts! (Talk about ironic considering how un-artistic this pile of shh...is. Looks like there's nothing to look at but a freaking blankwall fancing Delancey and check out how the streetwall is broken with its neighbor on the Ludlow side (right side of this pic). A Rumbling & Bumbling that went unsolved a while back was the steel frame rising at the corner of Delancey and Forsyth Streets on the Lower East Side, the site of an old parking lot next to Sara D. Roosevelt Park. Why the suspense, developers? Oh, because it's going to end up looking like that. Citizens of the LES, behold 38 Delancey Street, and its fairly spectacular website. Sixteen stories and 57 apartments coming at you via Yang Tze River Realty and architect Harry H. Hong. As a tipster put it: "sort of looks like The Ludlow growing out of a suburban strip mall." To which we say: The Ludlow is the mother****ing Great Pyramid compared to this thing. What's the purpose for that freaking second floor blankwall? It's like all these cheapskate developers and their numbskull hackitects are trying their best to give us the most garbage developments as they possibly can. 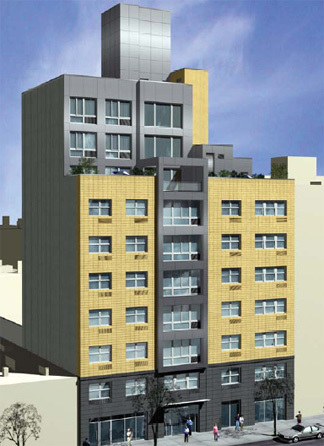 Plans for a new four-story building on the Lower East Side for the artists collective and community center ABC No Rio were officially filed yesterday with the Department of Buildings. The filing is an early step in the process and the plans have yet to be approved, according to the DOB Web site. 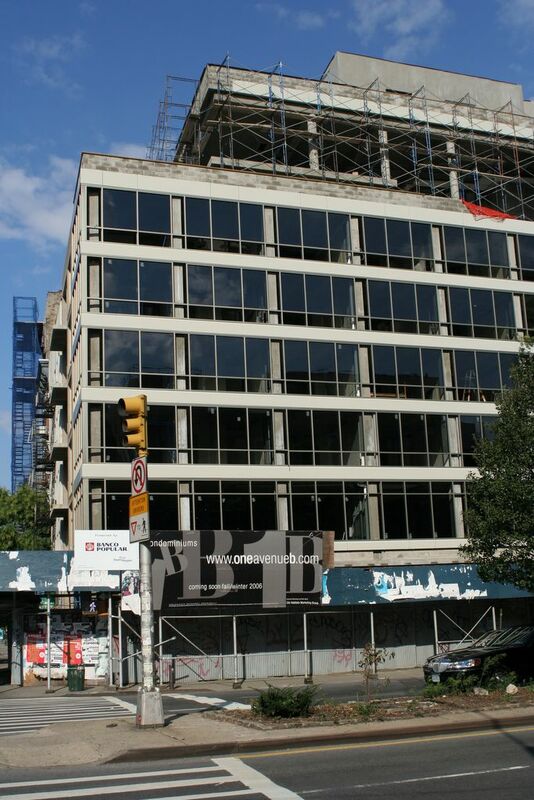 Construction for the new facility at 156 Rivington Street was expected to begin in late 2009 or early 2010, said the nonprofit's director, Steven Englander. 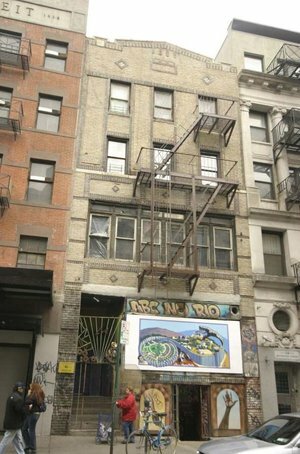 ABC No Rio fought for years to acquire the once-vacant building from the city. The group now hosts performances, art classes and gallery exhibitions at the building, located between Suffolk and Clinton streets. It bought the structure for $1 in 2006 from the Department of Housing Preservation and Development. The nonprofit, founded in 1980, proposes to demolish the four-story, 5,000-square-foot building and replace it with a four-story, 6,200-square foot building, Erlanger said. "It has been rough going. We don't have a board of high-rollers to bail us out," Erlanger said. The collective has raised about $1 million of the $3 million needed for the new building, including a $500,000 grant from the Manhattan borough president's office. Erlanger said it was unusual that a nonprofit that has fought gentrification on the Lower East Side has managed to construct a new building. A year ago, the group decided to build a new building instead of rehabilitate the old one, which has a foundation dating back to the 1800s and was rebuilt in 1917.